Whether you're a horror fan who enjoys jump scares, gore, monsters, or a sharp social commentary (Jordan Peele, we're looking at you), new to Netflix movie 'The Silence' will satisfy none. It's a shame too because it's got a great cast between Stanley Tucci, John Corbett, Kiernan Shipka and Miranda Otto (reunited from 'Chilling Adventures of Sabrina'). One can't tell whether its crapness is down to the uninspired screenplay (Carey Van Dyke, Shane Van Dyke - 'Chernobyl Diaries') or basic AF direction (John R. Leonetti - 'Annabelle', 'Mortal Kombat: Annihilation'). In any case, it's just bad. And not even so-bad-it's-enjoyable bad. 'The Silence' sees the world come under attack by bat- or Pterosaur-like creatures called 'Vesps'. Ally Andrews (Shipka) and her family go in search of refuge, discovering along the way that the Vesps attack when they hear noise. If that sounds like 'A Quiet Place', it's no wonder because it's essentially a knock-off. As with 'A Quiet Place', forest settings play a big part, Shipka's character is deaf, and her family communicate through sign language. There is also inspiration from Hitchcock's 'The Birds' present, for example, when the Vesps sit ominously in vast numbers on overhead cables on the highway. Mind you, 'The Silence' can't hold a candle to 'The Birds' or 'A Quiet Place'. It totally waters down the impact and originality of both. 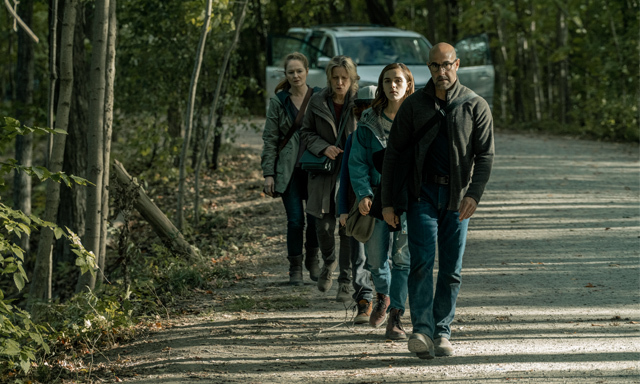 The characters of 'The Silence' are so bland that you never really feel a drive to root for them. The acting feels like something out of a TV movie, even from such established, typically charismatic actors. You'd wonder if Leonetti directed them to up the drama and campness of the story. Even so, it's not dramatic, it's not camp, and worst of all (given this is meant to be a horror), it's not scary. Everything about the film is predictable and cliche, and we've seen it done a thousand times. There is no ambiance, no sense of tension. There's even a bit where the family accidentally kill a woman which is more funny than traumatic. The Vesps aren't even all that creepy-looking - unless you've a fear of bats or winged creatures, I guess. The design is uncreative and CGI effects unimpressive. Leonetti's background as a DOP (on 'Insidious' and 'The Conjuring') is evident as he tries to disguise the shoddy monsters through dark, grey cinematography. But we see right through it, Leonetti. One gets the sense that better SFX wouldn't have helped much either, because all the other essential components for horror are still absent. The last 25 minutes of the Netflix movie go into this weird cult narrative. After the buildup was so mucked up, the finale has little to no emotional or frightening impact - not to mention you know exactly how it's going to play out. In conclusion, 'The Silence' is a complete and utter waste of your precious viewing time. You'd be better off sitting still - in silence, if you will - twiddling your thumbs for the running length of this movie (90 mins) than sit through it. I guarantee you it would be more entertaining.